You Should Immediately Start Sending Lead Nurturing Emails! Why? In our previous blog post about marketing emails we told you that lead nurturing emails can be a great tool for informing certain segments of your audience about your offers – but not only about the product features and prices. You can educate them, tell them why it is good for them personally to convert, and what benefits they can expect from taking action and clicking on your CTAs. According to Gleanster Research25% of your leads are sales-ready – which means you only have to give them a good offer to convert. But this doesn’t mean that they will be open to anything you send. Segmentation plays a crucial role in lead nurturing. If you have segmented lists – and you should – than you can send out emails which talk directly to a certain group of your leads in a much more personal way than a simple sales letter would. Also, the same research shows that 50% of your leads are qualified, but are not ready to convert just yet. They need a push – you have to tell them why it would be good for them to choose you. There are certain types of lead nurturing emails that can do this – and we will talk about those now. Educational emails are one of the best types. If you have data (like on-site behavior) about your leads, you know what they are curious about and what is it that they don’t know about your offers. This doesn’t mean you should just throw in a bunch of product features. You should take your time to compose a message with your email editor that really gives valuable information to your audience. And be specific. In one email, cover only one topic. If you are selling something, don’t speak about product features, rather focus on benefits: what can be done with your product and why is it good for them. If you offer a service, tell them why services like yours are important and what benefits they provide. Don’t sell hard, just provide interesting details. Do include a CTA, but be a bit subtle about it. In your emails you can also inform your audience about various chances to connect with you. If you know which social networks they use, ask them to follow you there as well. Try to acquire more channels to communicate with your leads to increase the chances of conversion. The more connected you are the more likely they will trust you and promote your message – provided you publish valuable content. There will always be a certain amount of passive recipients on your list – and likely a fairly big fraction of them will fall into this category. Lead nurturing however is a way to reactivate them. For example you can ask them for feedback. You can ask for their opinions on the content, the frequency, the design and readability of you emails. This way you can get valuable feedback, and spend time with your email editor to improve you emails, but that is only one benefit. You can get the passive recipients to be active, to take the first step towards you. There will be some who will unsubscribe from your list, but don’t let that bother you. Scrubbing the leads that you couldn’t do anything with is a good thing. You will get a cleaner list with a higher percentage of people who are truly interested in you. So why should you start lead nurturing? The data is convincing. 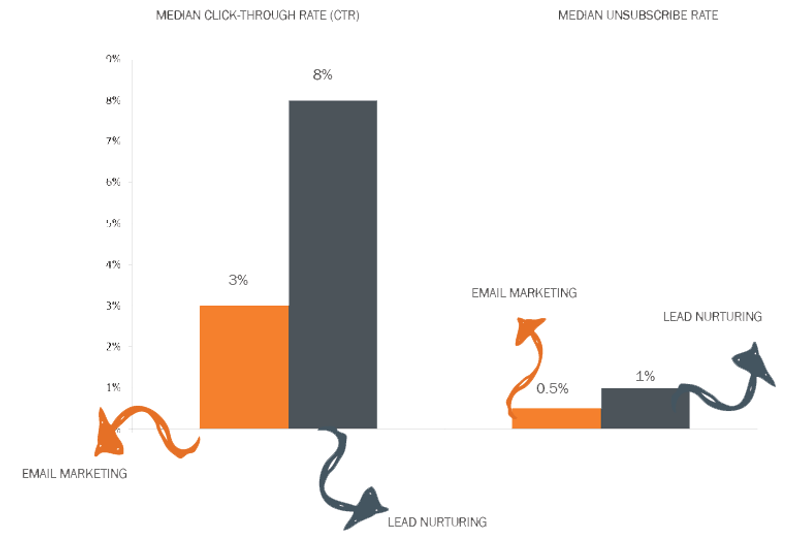 HubSpot found that lead nurturing emails are almost three times more likely to be successful than regular marketing emails – they have a click-through rate of 8% and 3% respectively. Leverage the power of segmentation and start lead nurturing as soon as you can! If you don’t have the necessary information about your subscribers? Release ebooks, case studies, quizzes and collect more data about them. Store and use every personal information very carefully since you don’t want to ruin your reputation, rather build a win-win relationship with your clients.